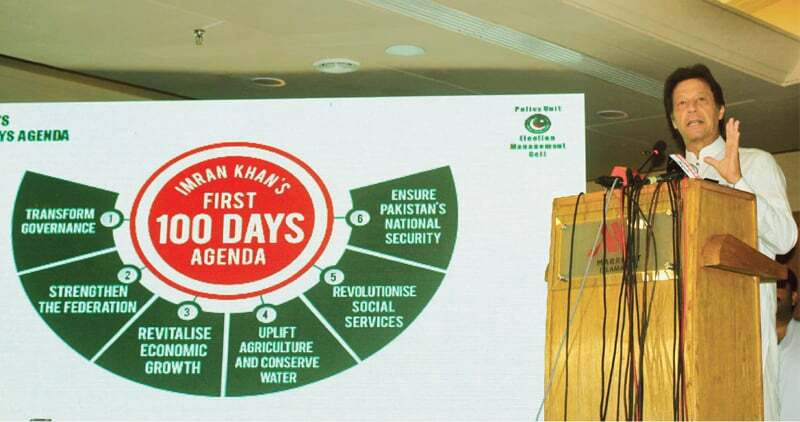 ISLAMABAD: Exuding too much optimism and confidence, the Pakistan Tehreek-i-Insaf (PTI) on Sunday unveiled its ambitious “agenda” outlining the party’s commitments for starting work within the first 100 days of forming its government after the 2018 general elections. The salient features of the agenda are expeditious merger of the Federally Administered Tribal Areas with Khyber Pakhtunkhwa, bifurcation of Punjab province and reconciliation with estranged Baloch leaders. The agenda, prepared by the Policy Unit of the PTI’s Election Management Cell headed by former chief secretary of KP Shahzad Arbab, was unveiled at a ceremony attended by the party’s chairman Imran Khan and other top leaders. The agenda also contains a plan for introducing a development package for Karachi and a programme for alleviation of poverty from the country, besides a number of steps for improvement of economy. The agenda is based on six themes — transforming governance, strengthening the federation, re-vitalising economic growth, uplifting agriculture and conserving water, revolutionising social sector and ensuring national security. 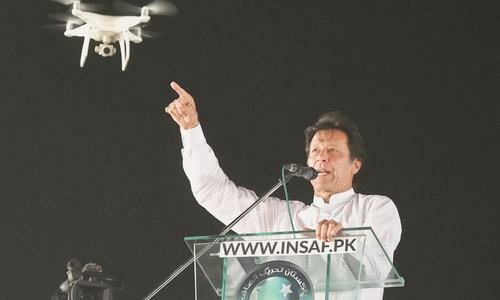 Imran Khan said a government could take difficult decisions only during its initial days as this was the time when it had the maximum strength. He highlighted the “achievements” of the PTI-led coalition government in KP where he claimed they had depoliticised bureaucracy and police. Terming overseas Pakistanis an asset for the country, Mr Khan spoke about bringing in investment and capability into the country by tapping into the pool of six million overseas Pakistanis. He said the PTI had gained experience and capability through five years of its government in KP which would help his team run the country in a much better way than they could have five years ago. 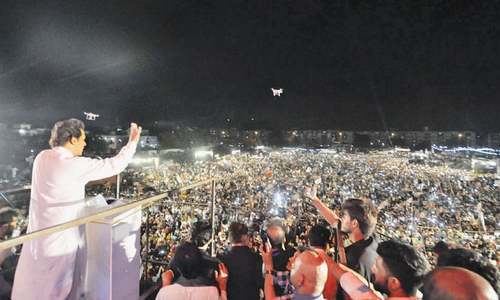 In five years, he said, the PTI had also learned about how to deal with resistance by the powers of status quo. He vowed to introduce “civil services reforms” in the country which would help improve delivery system. 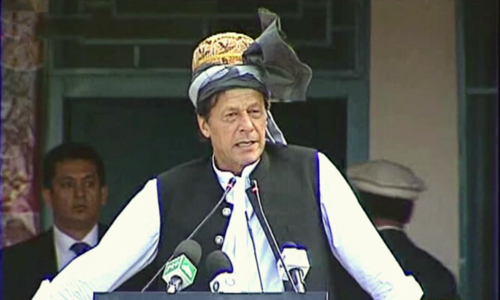 FATA MERGER: PTI vice-chairman Shah Mehmood Qureshi said all laws of Pakistan would gradually be enforced in Fata in consultation with the local people. He said the PTI had expressed reservations over the draft law on Fata reforms prepared by the government and all proposals of the party had now been incorporated in the draft. The bill which would be passed by the National Assembly on Wednesday would be “reflective of the PTI’s thinking,” he added. Mr Qureshi said a mega development plan would be implemented in Fata for which the other provinces would give three per cent share from the amount they received from divisible pool. He said the black Frontier Crimes Regulations would be abolished and a legal infrastructure would be provided to Fata which was necessary after the passage of the bill extending the jurisdiction of the Supreme Court and Peshawar High Court to the tribal region. SOUTHERN PUNJAB: He said the PTI was committed to bifurcate Punjab which presently had 110 million population, which was 57 per cent of the country’s total population. He said Punjab was larger than KP and even many countries of the world. Mr Qureshi said the PTI would carve out a new southern Punjab province which would be given complete autonomy. He said the new province would be made an agricultural hub in the next five years and an economic package would also be announced for the people of southern Punjab. The youth of the new province would be provided job opportunities through setting up of food processing industry. BALOCHISTAN: The PTI vice-chairman said they would heal their wounds and reconcile with the estranged Baloch youth who had taken positions on mountains and were being used by intelligence agencies of India and Afghanistan. He said they would fulfil all promises with the Baloch people and ensure implementation on job quota reserved for the province. 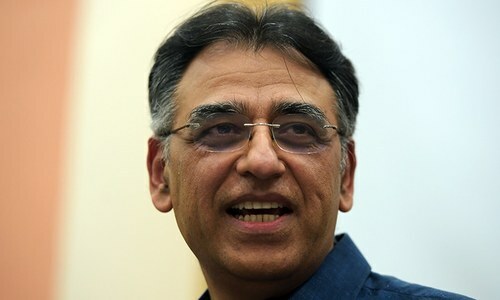 KARACHI: Mr Qureshi said the coming PTI government would announce a “federal package” for Karachi after implementing a six-point agenda for the city. The six-point agenda for Karachi includes improvement in law and order situation, crackdown on extortionists and China cutting mafia, elimination of militant wings of political parties, launching a public transport system, a housing infrastructure policy and empowerment of local government. 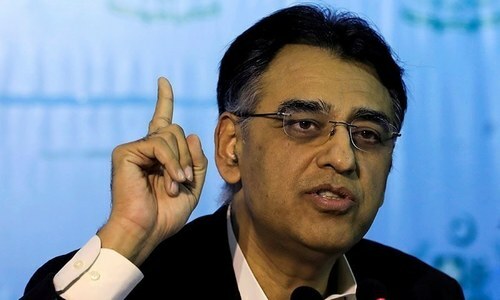 ECONOMIC DEVELOPMENT: MNA Asad Umar presented the salient points of the economic policy of the PTI government and vowed that the party would create 10 million jobs, revive manufacturing, rapidly grow small and medium enterprises sector, facilitate private sector to build five million houses, boost tourism, reform tax administration, transform state-owned-enterprises, fix energy challenge, make China-Pakistan Economic Corridor a game changer and enhance access to finance. AGRICULTURE: Former secretary general of the PTI Jahangir Tareen highlighted the steps the PTI government planned to take for uplifting agriculture sector and for conservation of water. He said the party would impose an “agriculture emergency” to take steps on war-footing basis to increase farmers’ profitability, improve farmers’ access to finance, transform agriculture produce markets, incentivise value-addition, revamp livestock sector and upgrade and implement the National Water Policy. KP Chief Minister Pervez Khattak talked about the party’s agenda to improve social services like education and health whereas MNA Shireen Mazari highlighted the party’s priorities for ensuring national security, announcing setting up of four national security organisations. She also highlighted steps needed for mainstreaming of seminaries and measures to fight terrorism. I am sure he will be very good at spending money Pakistan does not have. That is if he can manage to get his programs through the National Assembly. Excellent. PTI is the first party who has announced such agenda first time in Pakistan. Fully support PTI. Creating a southern Punjab province will result in another interior sindh/Balochistan type situation. it is very usual, MLN had also given his agenda but million dollar question is "HOW". IK is making fool people like others. As long as the agenda doesn't include eyeing your best friend's significant others, the chalked out plan should be acceptable. Still, based on the performance in KPK for the first 100 days, in fact the entire five years, many are sceptical. We understand these are electioneering tactics that do look good on paper, or might look even better when presented with special effects in PowerPoint or in a virtual online world, the actual results are and will be depend on a real history of performance, which I have to admit was subpar and not up to the mark. For the first time I see a party reaching out to the people in an organized way to share their vision for the country. I hope and pray the next govt is PTI's with Imran Khan as the PM. At least a vision and proper plan is there not alike others who even dont know who is going to perform what job. Its the time for IK to rule. 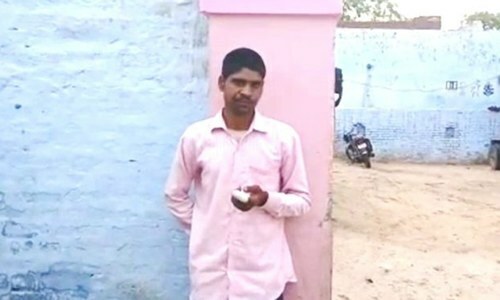 He deserve a chance. Specific mention of civil service reforms in the 100 days agenda is very significant. Civil service reforms have been long overdue and Pakistan can not progress without making the civil service truly subservient to the people and to follow the principles of honesty, integrity, impartiality and objectivity. It's sorry to say that our civil service have not redeemed itself from ACR culture which is a blackmail tool and makes civil servants subservient to their bosses not to the public. PTI should have also included provision of justice to the conmon man and judicial reforms in collaboration with the judiciary in the 100 days agenda. IK had promised similar rather more ambitious plan of 90 days before last election for the whole of Pakistan. Can he explain his party's failure in delivering the same and similar promise and pace in comparatively a very smaller part of Pakistan, i.e. KPK ? If khan had PM of Pakistan 10 years ago. I think it would be now third time of his nomination for the post of Prime minister. Pakistan has wasted last 10 years by selecting Zardari and Nawaz. PTI is the only party with a vision, IK can do it. PTI agenda is need of the hour, if we don't implement it, for sure we are heading for disaster. Our options are few while issues are many. One hundred day agenda is great! But transformation of 100 agenda into a reality needs a capable, honest, professional team! Where is IK's team who would achieve this agenda! 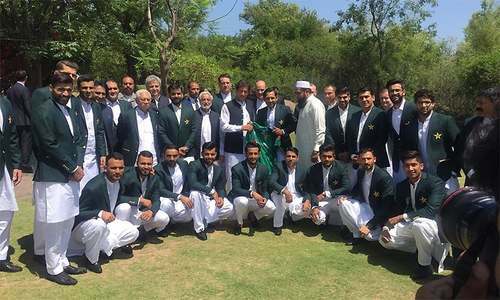 IK won the World cup because he had great team who delivered! Lee Kuan Yee transformed Singapore into a modern economy because he had a great team! At present IK has plethora of incapable and corrupt escapees from other parties, and bunch of intrinsic mediocres! One man cannot change anything! He needs to pick a winning team! If PTI really stands for what it claims, ’insaf’, and if it really wants to deliver on its promise of a just system, then its Karachi package should address the core issues that led to the formation of MQM. Namely, the unjust quota system applied exclusively in Karachi. Giving jobs to Karachi residents to government jobs in Karachi. And giving Karachi its fair share of revenue that it generates. Just a hollow promise of a federal package for Karachi is not going to win hearts or votes in Karachi. Why can’t the major national parties accept the core issues of Karachi. Any party that wants to bring Karachi in its fold will have to confess that injustice has been done to Karachi over several decades and then try to solve the real issues. Just throwing money at Karachi as if it were being done a favor, does not sound very sincere. May the people of Pakistan use their intelligence and realise that PML and PPP are nothing but thugs and give Imran a chance. I've full confidence in his abilities to steer Pakistan in the right direction. He's an honest and hard working leader who knows how to be a successful leader even with sparse resources. In my view, PTI's 100 days plan is achievable through hard work and having honest and diligent people on top, who can implement their ambitious plan. I think, PTI should be given a chance to sort out our current political and financial mess created by Nawaz Sharif and his corrupt cronies. Let's see, how this develops in the forthcoming election! I have never seen anything vaguer in my life. He can claim he has achieved all of them at any time. What about KPK. What about the BRT project. At first the PTI govt criticized Punjab government for the Metro projects. Then they changed their views and decided to start the infamous BRT project. The amount of loan to be taken was first 20 billion. Then it was raised to 50 billion. And now 70 billion. You have finished your tenure in KPK. Now who will repay the money with such huge interests. PTI failed to deliver in KPK! I frankly don't get it. They're going to create 10 million jobs over a period of 5 years. That's an annual growth of 2.71%. If we look at the labor statistics from 1990 to 2017, the annual growth rate is round 3.04%. So they're going to effectively decrease the job growth rate? Most of the economic packages announced seem to rely on the strategy "throw money at it and it'll get fixed." Really, so the real problem has always been a lack of funds? There is nothing else to fix? I keep hearing the word corruption uttered every now and again and that we need to fix that, but maybe that's just an echo. I am highly impressed by KPK police, health and education.We need Ik and Asad Umar on emergency basis. 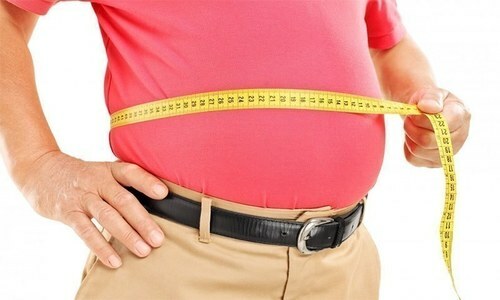 @Bill Spending on basic will result in improvements which will generate money. I am very hopeful and want PTI should get chance to form a government with people vote. what about the load shading pain ? what's their plan ? how they will control it ? india is making dams ? what's their foreign ploicy how they will handle it? I agree with the agenda completely. My question is how is he going to improve areas that are predominantly in provincial jurisdiction. For example Education, health care, law enforcement, governance of local bodies, water management, environmental degradation, civil infra-structure. Every one knows pre-disposition of the provincial to corruption, incompetence and inclination to mistreat people of Karachi.